How would you like to be shown the easy, fun and smart way to exploit your time with your kid to improve his mental abilities, and at the same time improve the bonding between you?How would you like to know the way to have a smarter child while you actually do much less "teaching"?How would it be like to know that you yourself are contributing at any given moment to promoting his/her mental abilities, their openness to learning, their creativity and affinity to relationship?Anyone can do it! This excellent book shows you that it is upon small choices to make the difference between tedious boring and annoying pass-time and pleasurable and highly productive time with your small ones.It is upon you, it doesn't take expensive education, nor sophisticated equipment or methods.The book offers many examples, clear rules and simple techniques. And on top of that all, this book phrases difficult psychological and even biological knowledge in simple terms, making them easy to act upon to generate not only amazing results, but also and more importantly, an enjoyable process.Don't wait for schools and kindergartens to do it! Most of them are not aware of the principles described in this book. Even if they are - most of them are not properly suitable to act upon them. "Saving My Child's Brain" teaches, in a light and clear language, how each one of us, regardless of profession or education or experience with children, can improve his/her parenthood. The book, which is based on unique assemblage of experience and extremely broad and profound education, includes numerous examples, clear rules and simple techniques which are suitable for all parents and educators. The book “Saving My Child's Brain” takes you by the hand, from the very basic question of "why should I deal with it in the first place?" to the basic understanding of the level of activity of the brain and the merits of its fluctuations. It goes through the basic principles of learning – this time in plain language and humoristic examples.The book deals with enriching the brain capabilities in a wide range of domains: from language to rhythm, from imagery to bodily integration, and more. 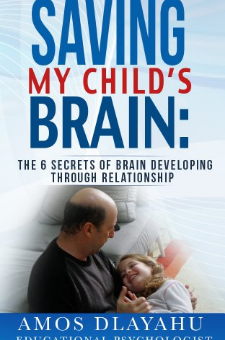 “Saving My Child's Brain” is based on original integration of "cutting edge" methods that yield exceptional results, with basic principles that are too often neglected during the daily rat-race.It shows you the way to build better relationship with your kid, make yourself a lifelong one-of-a-kind companion, have a smarter, happier, less confrontative child, one that is more flexible and independent, who is open to learning, ready to live in creative ways and open himself to people and experiences. Amos Dlayahu M.A. is a psychotherapist and an expert in educational psychology who walked an unconventional route to get where he is today. Once a young volunteer, an agricultural worker on a Kibbutz, a soldier, a paramedic and a social activist, Dlayahu went on to become a teacher in a democratic elementary school, and a participant in the founding of an anthroposophical elementary school.Mr. Dlayahu has learned, experienced and taught some of the most powerful and revolutionary educational methods known today. He has accompanied hundreds of parents on their quest towards better parenthood.The author was occupied with the questions described in this book from a very young age. He spent dozens of years gathering the knowledge and techniques described in this book, tried them, perfected them, arranged them and formulated them such that they become simply understood. He also offers Skype consultations to anyone who needs his personal attention. Please feel free to contact through amosdla@gmail.com.